Santosh and Anand applied for a credit card at XYZ bank as they wanted to be the beneficiary of various discounts and reward points that the plastic money offers. Anand didn’t do his homework properly by not checking the essentials one must have to apply for a credit card. In contrast, Santosh had checked every single detail including the eligibility, prior to making a credit card application to the lender. And on the very grounds of eligibility, he got a nod from the concerned bank. But the case of the other fellow Anand was rejected as he failed to meet the eligibility criteria set by a lender. What’s worse was that he shared the news across social platforms with a caption that read – ‘I am going to dazzle with a new iPhone’. He was confident of gaining a nod from the bank due to his healthy income. But his CIBIL score, surprisingly, was on the lower side due to some defaults he made on the loan in the past. When he got to know of the rejection and reasons for the same, Anand was left in a state of shock and could not hold on to his emotions. But you must not get overly concerned and instead keep an eye on the eligibility for a hassle-free credit card approval. 1.3 How to Check Credit Score Online at Wishfin? 1.5 Credit Card Application Rejected on a Poor Credit Score? Practice These Cardinals to Raise Your Score & Get Approval! 1.6 Why Are Credit Cards Preferred Over Cash? The eligibility criteria with respect to age, income and residential status can differ across the banks in India. You can glance at the table below to check the credit card eligibility criteria of different banks. Are you eligible for a credit card? The answer lies in factors like income, credit history, age, etc. Of the factors mentioned, the income would be a vital part in not only deciding the creditworthiness of an individual but also the amount of credit limit to be sanctioned. You can check various factors that can affect your eligibility for a credit card. Age –Your age plays a key role in determining your eligibility. The minimum legal age should be at least 18 years. If you are under 21 years and want to get a card for yourself, you should have a steady income or you need to have a co-signer who can bear all your expenses of the card bill. Stable Income – The income of the applicant is one of the most important factors which is taken into account while determining his/her eligibility. It indicates the amount of credit limit that can be sanctioned to you by the credit card company. In order to secure a credit card, you must have a regular and stable source of income. Also, the income criteria can differ across the cards you would apply for. Some cards would require an individual to earn a specific amount of salary. If the card is taken for a minor, then the co-signer should have a regular income. It gives you the ability to pay the bills for your purchases. Positive Credit Score – A healthy credit score makes it easier for you to gain the lender’s nod for a credit card. The credit report is the base to get the card for yourself. It is generally based on factors like how many cards you possess currently, the debts on each card, any previous loan taken, repayment history, missed any repayment, any bankruptcy charges, etc. These factors are taken into consideration by the credit bureau to decide your credit score. To get a credit card with a poor credit score or no credit record, one has to fall back on a secured credit card. The credit card company takes an amount before giving you the card, which they hold as the security and use the amount in case the cardholder defaults. Less Previous debts –Any previous debts that are still pending can lessen your chance to get a credit card. As you know the credit card is a type of loan taken from the company for few days which needs to be repaid back after a certain period of time. So, the previous debt can be a hindrance to pay the newly taken credit card. It becomes a risk factor for the lender as the borrower can face problem to pay back and could well become a defaulter. Thus, if the debt amount is high, the chances of having your own credit card is less. Co-signer –The co-signer is required if your legal age is either too small for you to have a credit or you don’t have an income to pay your bills. The co-signer is also asked when you take the bad debt credit card. They take the responsibility to pay off your bills in case you don’t. Your responsibility of paying the balance is equally shared by them. The term Eligibility for Credit Card Upgrade might surprise you. But banks do assess the card upgrade eligibility based on your repayment track. If the bank whose credit card you are using finds your repayment track to be smooth, there’s no denial that you can be eligible for a credit card upgrade. The card when gets upgraded come with exciting features that may not be the case earlier. Plus, you can enjoy a greater credit limit. 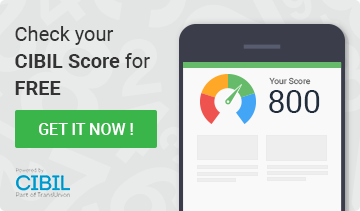 How to Check Credit Score Online at Wishfin? You can check your credit score free of cost at Wishfin, an online loan marketplace. The same can cost you ₹550 or more when you fetch it on the website of credit bureaus like CIBIL, Experian and others. Both CIBIL and Experian are now official partners of Wishfin. You need to share your personal details such as your name, date of birth, PAN, residential address, e-mail ID, mobile number, etc. The details will undergo an authentication and after that, you would get login credentials to view the CIBIL report on your registered e-mail ID. The CIBIL report will contain a complete detail of your credit health by showing the extent of credit limit utilization, the detail of any skipped or late payment, debt settlement, if any. The detailed report can suggest you necessary measures to improve your CIBIL score if that’s on the lower side. Now that you are aware of the eligibility criteria and the factors that prompt the lenders to say ‘Yes’ to a credit card application, you must make sure to meet those. On finding yourself eligible, you can apply for a credit card online by visiting the official website of the banks. The lenders can give an instant approval to your application as you are eligible. Those who struggle to meet the criteria may have to wait further for the card to come their way. Credit Card Application Rejected on a Poor Credit Score? Practice These Cardinals to Raise Your Score & Get Approval! A poor credit score can mar the prospects of a credit card application approval. So if the score turns out below the desired level of 700, lenders can reject your application. It may disappoint you but there are ample ways by which you can improve your score. Firstly, check what is contributing to a poor score, there can be many reasons for the same. However, the one reason that remains prominent for most is their irregular payment routine thanks to overspending. Sometimes the impulsive urge, which we all live with, plays a villain that does not show the evil face upfront but appear that way by shortening your bank balance at the end of a month. Now that prompts late payment or even compels one to default. All that and more only leads to a poor score. You, therefore, need to exercise control over such impulsive behaviour to save enough to ensure a smooth repayment. Many a spends one make can be done away with. That’s why you should jot down the necessary spends and remove anything that you find unnecessary. What that does is yield savings and enhance the possibility of timely payment and an increase in your credit score. Keep maintaining a regular flow of payment to get your score move up all the time and gain an approval to your credit card application. Why Are Credit Cards Preferred Over Cash? The Credit Card is one of the most popular products which is used by the people as a mode of payment. They no more depend on the orthodox method of carrying a pile of cash to meet their needs and make payment. It fulfills your need of imminent requirement of money. In other words, it can be said that the credit card is like a box full of exciting features like reward points, cash back, extra travel miles, discounts etc. which encourages people to opt for the card. The Credit Card is the miniature form of the loan, where a certain amount of credit limit is provided to you for a time period and you can use that amount for many purposes through the usages of the card. Every month a credit card bill is generated and you have to pay that bill on or before the due date. Till the time you pay your bill on time, no interest will be incurred on your expenses. This feature makes it more affordable than availing a loan. But, if you miss the due date or pay the minimum due amount, the interest rate will be charged by the credit card company. To apply for the credit card, one must know the eligibility criteria that is required. Now that you have the detailed information about the credit card eligibility, you can use them to get one for yourself. Do choose the card according to your purpose and requirement. Try to maintain the good credit score as it is key to get a credit card. The eligibility criteria must be fulfilled to get a credit card. You should shop around a bit and choose the one with more benefits. Enjoy your credit card with responsibility.